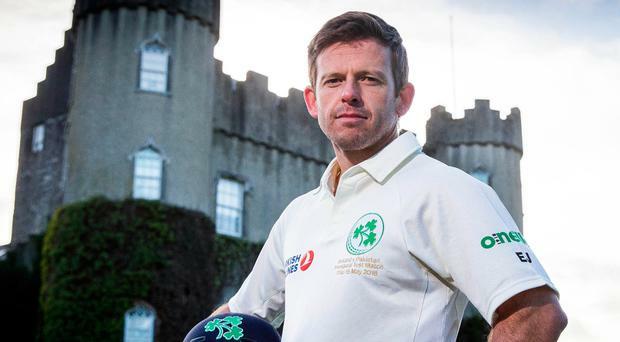 Ireland are unbeaten in three Twenty20 games after an impressive five-wicket victory over Sussex in yesterday's Ed Joyce testimonial at Arundel. A lightning, unbeaten 55 by skipper Gary Wilson, from just 20 balls which included four consecutive sixes off Will Beer, hurried the Ireland XI to victory with his fourth four ending the match with no fewer than five and a half overs to spare. Following on from their last two games at the Tri-Series in Holland last weekend, when they beat Scotland by 57 runs and tied the second match, it maintains the momentum going into this week's two internationals against India at Malahide. William Porterfield (10) replaced the absent Paul Stirling at the top of the order, but he was upstaged by James Shannon who hit 29 from 23 balls, with three fours and a six. When Simi Singh (5) followed Andrew Balbirnie back to the pavilion at the end of the 11th over, Ireland were still 57 runs short of their 136 target, but Wilson took over to end the game in double-quick time. The bowlers can also be well pleased with their efforts before they take on the might of India on Wednesday. Stuart Thompson was the bowler who got Joyce's wicket for the final time, the retired international caught by James Shannon for nine as he ended his career with an appearance for his county against his former international team-mates. England's Luke Wright was Sussex's top scorer before he was caught off George Dockrell (2-0-10-1) but after Ireland had reduced the county to 77-5, they restricted them to just 58 more from the last 58 balls. Peter Chase picked up two wickets in his final two overs to finish as the most successful bowler but Boyd Rankin and Kevin O'Brien both bowled their four-over quota at just 4.5 runs an over. Andy McBrine, on his return, was comfortably the most expensive (2-0-27-0). Scores: Sussex 135-8 (20 overs, L Wright 48; P Chase 3-29, K O'Brien 2-17, S Thompson 2-33) Ireland XI 136-4 (14.4 overs, G Wilson 55 not out, J Shannon 29, A Balbirnie 21). Ireland XI won by six wickets.